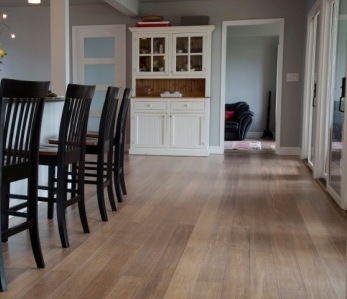 Home › Flooring › What Types of Rugs, Pads, and Mats Are Safe for Use on Bamboo Flooring? 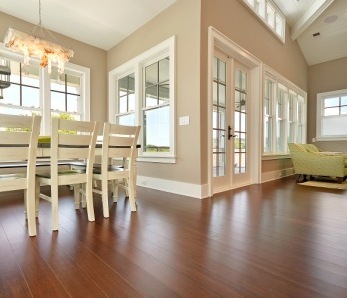 What Types of Rugs, Pads, and Mats Are Safe for Use on Bamboo Flooring? 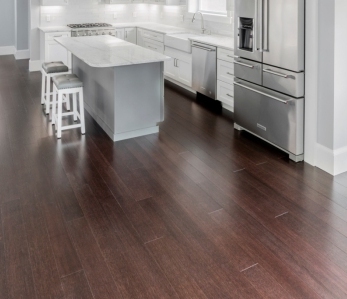 Strand woven is the hardest type of wood flooring on the market, but that doesn’t mean it can’t scratch. That means it’s advisable to stay away from fibers like coir, a natural but rough material used in the construction of many door mats, and jute rugs. That scratchy rough texture is great for removing soil and grit from the soles of shoes, but the flip side of the coin is that it can also damage your bamboo flooring, especially with people stamping and rubbing their feet on it as they enter your home! 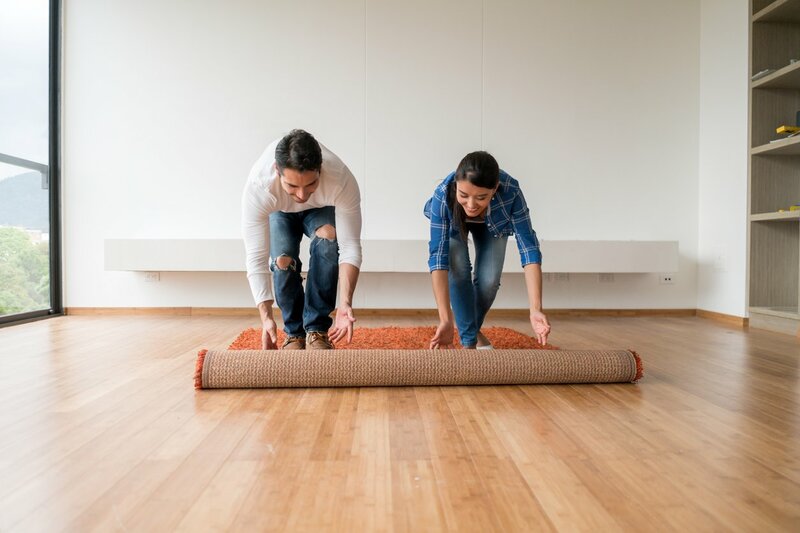 (Of course, if you find a coir or jute mat with a natural rubber backing, you’ll probably be okay!) There are companies that make door mats with thick natural rubber backings that hold them in place and that won’t damage your bamboo floor. You can even find mats made from 100% recycled rubber that are attractive and safe for your floor. 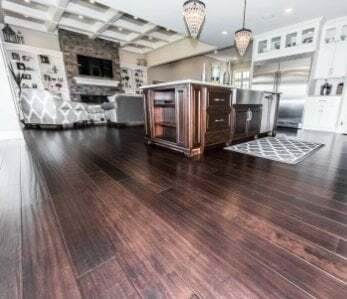 For more formal entries, you can choose a nylon or wool area rug laid on top of a natural rubber based pad for a more sophisticated look with the same level of protection for your floor. The same is true of hall runners or kitchen mats. Natural rubber pads beneath will not only protect your flooring from scratches but will also make your runners or rugs more comfortable and safer to walk on. Natural rubber rug pads have been on the market for over three decades and have a proven track record for performance and safety. Plus, natural rubber is a renewable resource that won’t stick to your flooring over time like a less expensive PVC (polyvinyl chloride) pad will. Natural rubber is white — not black! (The black color in rubber tires is due to the addition of black carbon, which not only turns the rubber black but also reinforces it to make it stronger.) Natural rubber outperforms and out-grips PVC and plastic rug mats, and with the exception of certain vinyl floors and finishes, will protect — not damage — wood or bamboo floors. Natural rubber is a successful component of the science and technology of using plants to produce useful products that don’t deplete our natural resources nor add to the environmental hazards caused by the manufacture and use of petroleum-based products. Its use is yet another way to live comfortably and responsibly without harming future generations! Through their support of the SNRI (Sustainable Natural Rubber Initiative), companies like Michelin (a tire manufacturer and one of the largest consumers of natural rubber in the world), and GM, are striving to do their part to ensure that natural rubber is harvested responsibly and that existing plantations are used efficiently in lieu of clearing land for new plantations. The SNRI is working on many levels, including conservation of protected areas and responsible water management practices to ensure the sustainability of natural rubber as a worldwide resource. Most area rugs used in a living room or dining room setting are large — 8′ x 10′ on average — and require an equally large pad, both to protect the floor and to keep the rug from slipping. A good rug pad also provides cushioning, making walking on a large area rug more comfortable as well. A good — and safe — choice for a large area rug placed on top of a bamboo floor is a 100% felt rug pad. It offers excellent cushioning and support, and make the rug less likely to slip. And because it’s denser and thicker than a traditional non-slip rubber rug pad, it offers a better buffer between a large expanse of carpet and your flooring. One of the reasons for choosing bamboo — aside from its natural beauty and resilience — is the fact that bamboo is a renewable resource that can be replenished more quickly than hardwood. Bamboo is a fast-growing grass plant that takes a maximum of 7 years to grow to maturity, compared with many decades for a typical hardwood tree. At Ambient Bamboo Floors, we source our bamboo from well-managed forests, and we can source FSC-Certified bamboo by demand; furthermore all of our products adhere to the Lacey Act, to ensure that our bamboo is legally sourced with minimal damage to the environment. 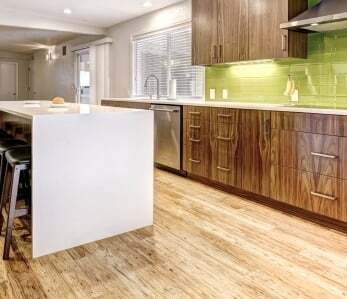 Check out our line of bamboo flooring, low-voc and no-voc adhesives and finishes and compare our prices today! ‹ My Bamboo Plywood Has Warped. How Do I Fix It?